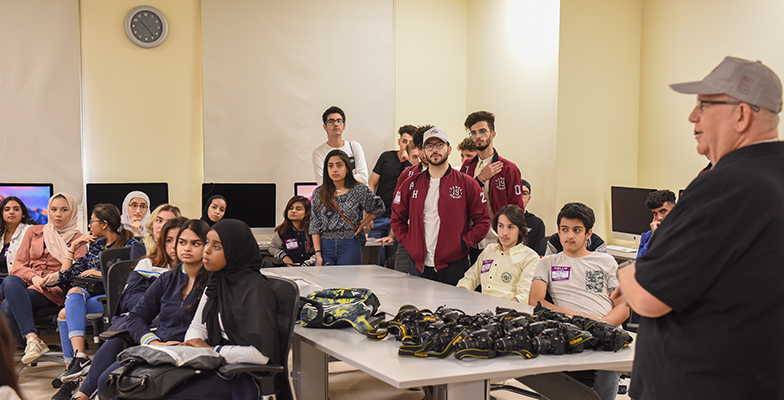 Students from schools all across the United Arab Emirates took part in the AUS Media Day held today, April 17, at American University of Sharjah (AUS). The event, the first of its kind to be held at the university, featured a wide variety of activities that included screenings of media works by AUS students; media competitions and workshops for participating students in social media, video storytelling, TV presentations and commercials, and photography; as well as lecture on mass communication as a professional choice for prospective university students. 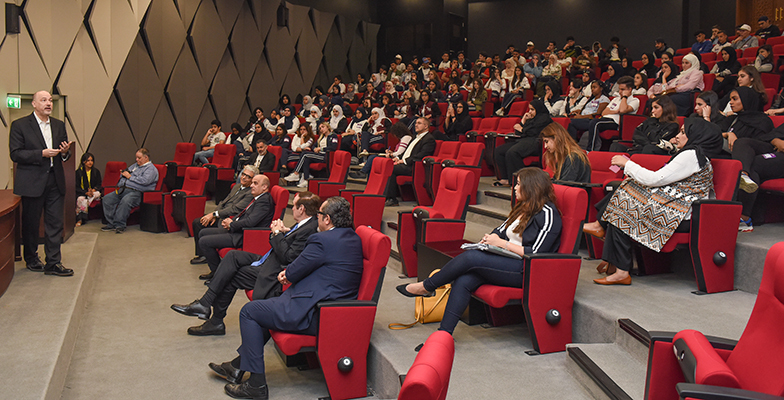 Organized by the university’s Department of Mass Communication in collaboration with the Office of Enrollment Management (OEM), the event introduced high school students to the revised mass communication undergraduate program offered at AUS. 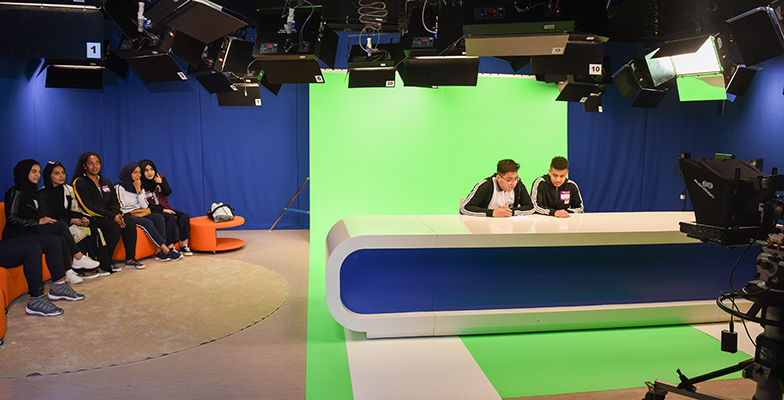 The program, which provides students with a high standard of learning and training environment in mass communication, reflects the latest trends in media education and industry practices and thrives on continuous engagement with the industry. Professor Kevin Mitchell, Acting Chancellor of AUS, welcomed the participating students and wished them a fun-filled and informative day. He also encouraged the students to tour the campus and meet with students and faculty to explore the various aspects of the university. “AUS is a student-centric institution with strong student governance, which means that students have a say in what goes on on campus. If you are thinking about university, look at things like the strength of its programs, its faculty and extracurricular activities, which combined make an education,” he said. 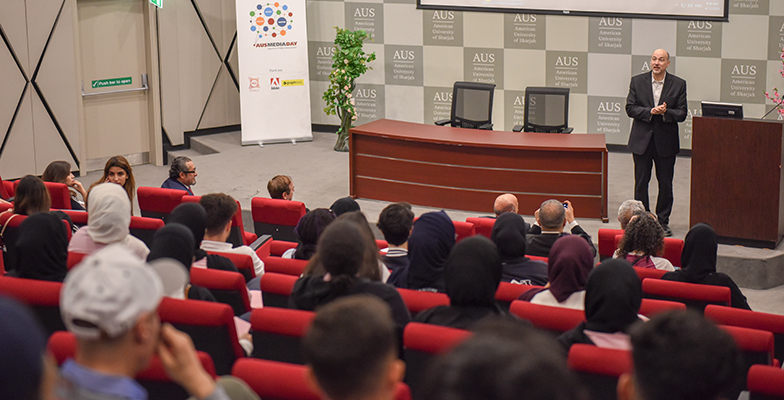 Welcoming the students to the event, Ali Shuhaimy, Executive Director of Enrollment Management, said that AUS is committed to organizing events such as these through its popular Sharakah program which comprises schools from around the UAE. He added that starting this year, AUS will be offering merit-based scholarships to qualified incoming students that amount to between 20 to 50 percent of the tuition. Commenting on the event, Dr. Khalid Omar Al Midfa, Chairman of Sharjah Media City (Shams), said: "Sharjah is currently striving to position itself as a world-class hub for media and creativity within the region. At Shams, we are very keen on fostering the community, and enabling individuals to motivate creativity and innovation. Hence, we are very excited to be a part of the inaugural event of the AUS Media Day that allows young local talent to better understand the world-class education in mass communication available for them here within the UAE, along with the competitive career opportunities that this field offers." The event, which was sponsored by Shams and Grapheast, saw 10 schools with more than 200 students and officials participating. The schools included: Al Shola Private School; Dawha Scool; Al Khaleej National School; Sharjah American International School; Al Durrah International School; Al Zuhour Private School; GEMS Wellington International; Liwa International School; Al Mawakeb Al Gharhoud School; and Greenwood International School. The AUS Media Day was held as part of the Sharakah program under which AUS has signed Memorandums of Understanding with a number of secondary schools in the UAE whereby the university will offer workshops to teachers and students; offer patronage of selected research, cultural, social and sporting activities and events organized by the Sharakah partner school; award partial scholarships to deserving students selected from lists provided by the schools; and offer university preparation courses, including SAT and TOEFL preparation courses, as well as recruitment of outstanding students from varied sociocultural and economic backgrounds to AUS. 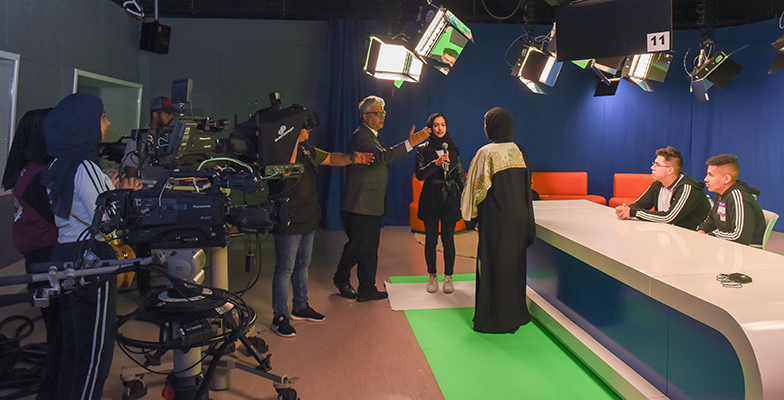 For more information about the mass communication program at American University of Sharjah, visit www.aus.edu/masscommunication.